Fender, Gibson, and Martin frequently recommend our services. Other highly-qualified repair shops, custom builders, and retail stores throughout the country consistently send us instruments for our finish work. We service Fender 50s and 60s: solid body guitars and basses, butterscotch, blonde, 2- and 3-tone sunburst, and custom colors (includes yellow base coat, white primer and DuPont® color and nitro clear coat). Gibsons/Les Pauls: Gold tops, all types of vintage sunbursts, and Gibson custom colors. Relic and aged finishes and parts: Includes aged tinting of finishes and plastic parts, aging of metal parts, and lacquer checking. This high standard of quality and eye for detail goes into every repair and restoration we do, regardless if you have a ’65 Fender Mustang, ’36 Martin Herringbone D-28 Shaded-Top, a ’59 Flame-Top conversion or even an original Les Paul Standard. Below is a list of a few of the most common repairs that we handle in the shop. You can be assured whether you are a regular Lay’s customer, or someone considering us for the first time, that your instrument will receive the highest quality workmanship available anywhere at any price. 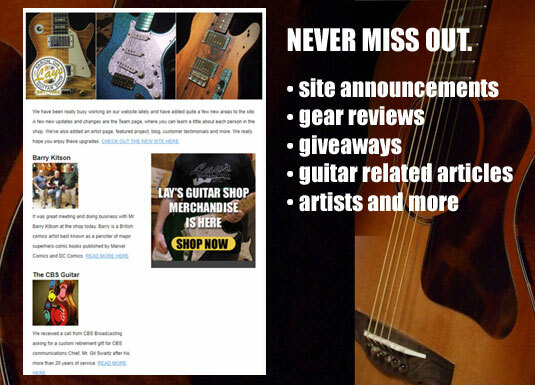 Connect with us to get the latest shop news and much more.